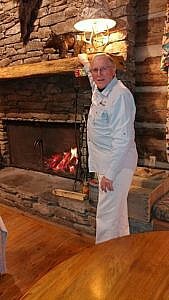 For our sixteenth episode of Meet The Swag Staff, we want to introduce Jim Rubendall, who is finishing his first season at The Swag, our Smoky Mountain inn bordering The Great Smoky Mountains National Park. If you are neither a night owl nor an early riser, there is a decent chance you have not met Jim, as he works overnight in Guest Services. Next time you come, however, come visit with Jim before you head out on a sunrise hike to Gooseberry Knob. He will have a warm cup of coffee waiting for you! Jim grew up in Shamokin, Pennsylvania but met Mary, his wife, when both were working in Charlotte, North Carolina. Between the two of them, they have five children and are in the process of adopting their 2-year old daughter, Harlyn. With a young daughter at home, Jim had been looking for an overnight position so he could be at home with Harlyn and Mary during the day. The guests! They are friendly and I get to see them in the morning when they are waiting to see the sunrise. My favorite place is Chef Linda's refrigerator because it is filled with desserts! I like to spend time with my family and we often visit family in Belmont. I also do a lot of computer work. In the off season, I am looking forward to taking Harlyn to Pigeon Forge and Santa's Land. I would go to Alaska. My nephew runs a convenience store there that you can only get to by seaplane! Jim has also had a long career in the world of computers. In 1966, Jim was involved in an elevator accident where a freight elevator broke free and pinned Jim to a wall when he was 27 years old. The injury forced Jim back into school where he became a computing expert. From the days of the early data processing systems (NCR 407 was the first that Jim worked on) to today’s computers, Jim has been working with computers and continues to operate his business, J Mar Business Services. After we acquired The Swag from Dan and Deener Matthews, one of our biggest concerns was what we do on the overnight, as we are not at The Swag seven days per week. We are so blessed to have Jim at The Swag to watch over the property and prepare for the next day. He is a natural in the hospitality world, incredibly diligent, and a man of great integrity. We look forward to having Jim back at The Swag for many years. Come visit Jim & Team at The Swag by reserving a room now. You can also reserve a room or book a dining reservation by calling the Guest Services team at 828-926-0430. And if you can’t sleep when you get here, come on down and spend some time getting to know Jim!